Action from Teversal's 1-0 defeat at home to Belper United. (PHOTO BY: Keith Parnill). 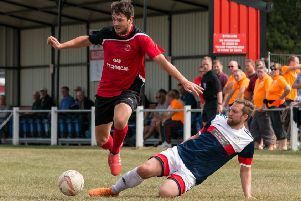 A killer goal deep into injury-time dealt a hammer-blow to the title chances of Teversal in the Premier Division of the East Midlands Countiues League. Entertaining mid-table Belper United at Carnarvon Street, Teversal missed a host of chances before being caught by a sucker punch that handed the visitors a 1-0 victory. They remain top of the division, but with the chasing pack having vital games in hand, the destiny of the title is no longer in their own hands. The match only went ahead thanks to volunteers who cleared the pitch of overnight snow, and both sides initially struggled to cope with the heavy conditions. Teversal almost scored on 28 when an excellent save by ‘keeper Mark Rathbone denied Khyle Sargent before Matt Wilkinson’s follow-up effort was headed off the line by Alfie Holland. Belper were also foiled by a fine stop, from James Turton, but Teversal went on to control the second period when Belper relied on some resolute defending. Waves of pressure saw striker Wilkinson hit the woodwork no fewer than three times, while Rathbone saved superbly from Danny Fletcher. However, Belper snatched the points when a cross to the far post was finished by James Rushby, with Teversal appealing, in vain, for offside. TEVERSAL LINE-UP -- Turton/ Lavelle (Griffiths 79), Pride, Laister, Sennett, Sargent, Wilkinson (Radford 75), Cox (Watson 85), Fletcher, Cockerill, Bamford. Subs not used: Short, Charlesworth.